Age of candidacy laws should be abolished: Why 18 year olds should be able to run for public office. If you can vote, you should be able to run for public office—any office. The Constitution’s age requirements for running for office represent yet another instance in which the Founding Fathers traded wisdom for simple prejudice. In January, state Sen. Linda Lopez of Arizona retired after 13 years in the legislature. Before announcing her retirement, Lopez looked for a candidate to endorse to fill her vacancy. She soon settled on Daniel Hernandez, Jr., a friend and a board member of Tuscon’s Sunnyside Unified School District. He agreed and began gathering support to run for office. A win seemed likely. There was just one problem. Hernandez was 24. Arizona law requires legislators to be at least 25 years old. But Hernandez initially hoped he could run because he would turn 25 just 13 days after being sworn in. It wouldn’t have been unprecedented. Young federal and state legislators-to-be have found ways to work around age of candidacy laws for almost as long as the laws have existed. Back in 1806, antebellum statesman Henry Clay was appointed to the U.S. Senate at the age of 29 and reached the Senate’s age of eligibility, 30, more than three months after being sworn in. No one seemed to mind. Hernandez wasn’t so lucky. As he found out, Arizona state law requires candidates to sign an affidavit proving that they will be eligible for the office they seek on Election Day, barring him from running altogether. The law was clear: 24-year-old Hernandez was unqualified to serve in the state Senate this year. But a 25-year-old Hernandez would have been fine. 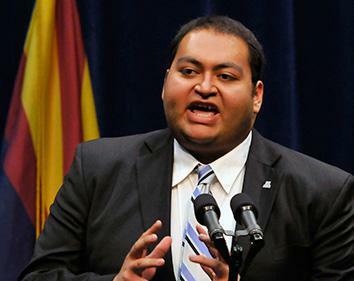 It didn’t matter that Hernandez had already worked on education legislation as a lobbyist and director of the Arizona Students’ Association. His service on the city of Tucson’s GLBT commission, a body that advises the city’s mayor and city council on queer rights, was similarly irrelevant. His management of state Sen. Steve Farley’s re-election campaign, his work as the Southern Arizona Director of former Surgeon General Richard Carmona’s Senate campaign, and his role as a Latino Outreach Coordinator for the Arizona Democratic Party all counted for nothing. And the job he is best known for, in the eyes of the law, was just as meaningless. In January 2011, Hernandez began working as a staffer to Arizona Rep. Gabrielle Giffords. It was Hernandez who, just five days after starting work, delivered the initial care that saved Giffords’ life after Jared Lee Loughner’s assassination attempt. In a speech at a nationally televised vigil for the incident’s victims, Hernandez claimed he wasn’t a hero. President Obama disagreed and said so. But the age requirements of the Arizona constitution don’t bend for heroes. According to the law, Daniel Hernandez is not an individual with a body of accomplishment. He is a 24-year-old. And 24-year-olds, the law presumes, are too immature to serve in the Arizona state house. President Obama called Daniel Hernandez, Jr., a hero. But the age requirements of the Arizona constitution don’t bend for heroes. Young people like Hernandez are rare, but not terribly so. Qualified candidates have their efforts thwarted by age of candidacy laws in elections across the country every year. Each time, people like Hernandez are told to wait their turn. Here is a seldom discussed truth about our democracy: The citizenship enjoyed by American adults under the age of 35 is a second-class citizenship. We gain the right to participate fully in American democracy on our 35th birthdays, and not a day before. For on that day, provided all other requirements are met, we become constitutionally eligible to run for virtually all federal, state, and local offices, including the presidency. The fact that very few of us will ever exercise the right to run for any office is irrelevant to the milestone’s significance. The consequence of the nation’s age of candidacy laws is that one-third of American adults—the more than 74 million people between 18 to 35—don’t enjoy full political rights: If they’re citizens, they have the right to vote without necessarily having the right to be voted for. This is wrong. The right of Americans 18 and older to vote was guaranteed by the 26th Amendment, which, after being speedily ratified in 1971, lowered the voting age from 21 to 18. That amendment came into being after years of protest by youths who could not vote for or against the wars they were forced to fight. Those protests were about competence as much as they were about unfairness. How was it possible that an 18 year old could be mature enough to kill, but not mature enough to cast a ballot? Today, the very same kind of question can be asked about the right to run for office. As Pomona College professor John Seery writes in his book about the Constitution’s age requirements, Too Young To Run, the age of 18, as the age of majority in most of the country, grants one the right to take on a whole host of consequential responsibilities. 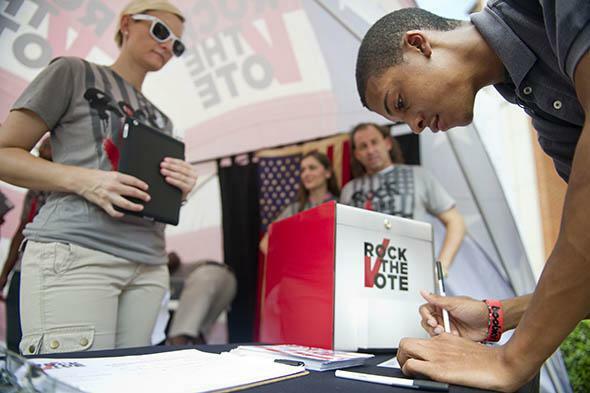 College sophomore, Denzel Fleming, signs a voting pledge during a Rock the Vote road trip bus tour on Sept. 5, 2012 in Charlotte, North Carolina. Seery believes, given all the other rights and responsibilities one takes on by the time they’ve turned 18, that 18-year-olds should also be granted the right to run for federal office by a constitutional amendment. But one could go even further. The 26th Amendment granted 18-year-olds the right to vote in both federal and state elections. A new amendment inspired by the 26th could similarly grant all adults 18 and older the right to run in all elections federal, state, and local—an expansion of rights that would have helped Daniel Hernandez as much as it will a 24-year-old hoping to get into Congress. Anyone who delves into the origins of the Constitution’s age requirements with the expectation that the Founding Fathers thought long and hard about them will be disappointed. The Constitution’s requirements represent yet another instance in which the Founding Fathers traded wisdom for simple prejudice. Age restrictions were never given the lengthy considerations given to property qualifications and restrictions based on citizenship—it was enough for men like John Adams to simply assume that civic competence grew naturally with age. In 1776, Adams delivered a hand-waving defense of Massachusetts’ voting age in a letter to James Sullivan, who would later become the state’s governor. “What Reason Should there be, for excluding a Man of Twenty years, Eleven Months and twenty-seven days old, from a Vote when you admit one, who is twenty one?” he wrote. “The Reason is, you must fix upon Some Period in Life, when the Understanding and Will of Men in general is fit to be trusted by the Public.” Translation: “You’ve gotta pick some age, right?” One can almost picture him shrugging as he wrote those words. Had there been a near universal age of majority as there is now, Adams and the rest might have chosen it as the starting point for candidacy rights. But in the absence of one, most of the colonies came up with their own arbitrary age requirements for candidacy. 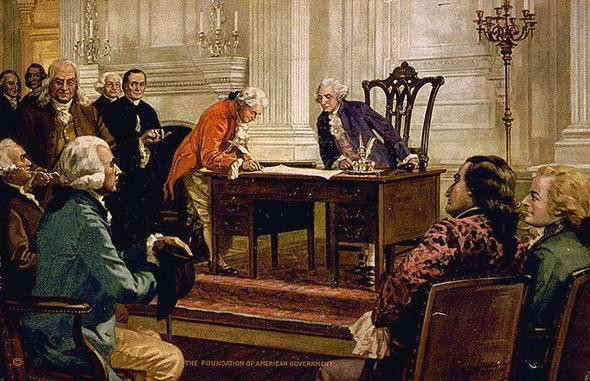 The drafters of the federal Constitution, after virtually no debate on the subject, would do the same at the Constitutional Convention of 1787. 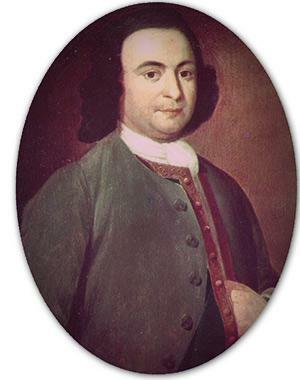 The only exchange recorded in James Madison’s notes on the convention about any of the age requirements in the Constitution—for the House, Senate, or presidency—took place on the 25th day of proceedings between Virginia delegate George Mason and Pennsylvania delegate James Wilson. It was Mason—a statesman Thomas Jefferson called the “wisest man of his generation” for his work drafting Virginia’s highly influential 1776 Constitution and Declaration of Rights—who was responsible for the requirement that members of the House of Representatives be at least 25. His argument was simple: He had been an idiot at 21 and figured that most 21-year-olds were about the same. 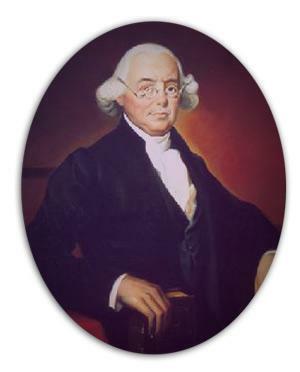 Supreme Court Justice James Wilson. James Wilson, a lawyer who would later become one of the first Supreme Court justices, was the lone dissenter. He argued, Madison writes, that age restrictions in general, “tended to damp the efforts of genius” and that old age restrictions made just as much sense as restrictions on youth. He also cited the competence of then British Prime Minister William Pitt the Younger—the English had been willing to let a 24-year-old lead an empire. Nevertheless, Mason’s view carried the day. The motion to set the House candidacy age to 25 passed 7–3. The ages proposed for the Senate (30) and the presidency (35) were later approved unanimously without discussion. George Mason delegate from Virginia. Reading Mason’s thoughts and the vote counts, you might assume that the convention was comprised solely of elder statesmen. In fact, 12 delegates were under the age of 35 and four of them—North Carolina’s Richard Dobbs Spraight, Maryland’s John Francis Mercer, New Jersey’s Jonathan Dayton, and South Carolina’s Charles Pinckney—were in their 20s when the convention began. All four, the finished Constitution would suggest, would have been too immature to draft and debate ordinary legislation in the new Senate. Yet all four were, incredibly, considered just seasoned enough to participate in the drafting of the Constitution itself. Since then, nearly all state constitutions have included age qualifications of their own. Some hew closely to those outlined in the federal Constitution. Many do not. Consequently, the right of a young person to run for office in the United States is determined by a nonsensical patchwork of statutes that is plainly indefensible for its arbitrariness, even if one genuinely believes that young people, by and large, can’t be trusted with elected office. A 21-year-old can govern South Dakota, for example, but can’t represent districts with a few thousand voters in Arizona or Colorado. North Dakota, like many states, can’t accept a governor under the age of 30, while Oklahoma, for reasons that are either lost to history or nonexistent, expects its governors to be at least 31. Texas is fine with 26-year-old state senators. The state of Delaware forbids state senators under the age of 27. The picture gets even more distorted when mayors are thrown into the mix. Under current law, an 18-year-old is legally qualified to govern millions of people in New York City, Los Angeles, and Chicago. But 18-year-olds are barred from being elected to Congress at all—it would be too risky, the Constitution presupposes, to let someone so young represent, say, Wyoming, a state with a population of about 500,000. Some might argue that the differences are justified by the notion that states and localities should be laboratories of democracy, with the ability to set many of their own rules and regulations. But it’s a perversion of that notion to suggest that laboratories of democracy should be given the freedom to be so plainly antidemocratic. In this case, what is and is not democratic isn’t dictated by the federal Constitution, which is also in the wrong. It is dictated by common sense—the right to run for office is something fundamental, something that shouldn’t vary from place to place for taxpaying, law-abiding young citizens who are otherwise equal under the law. The current patchwork of laws suggests that there are innate differences between being 21 in South Dakota and 21 in Arizona that make one qualified to hold office in one place and not the other. Even George Mason did not believe this. The one thing these barriers to public service have in common, of course, is their foundation in clichés about youth that seem less true every year. Of course, many young adults are immature and unreliable. But others are making critical advancements in medicine. They are thriving on Wall Street. They are tending to the underprivileged at home and abroad. They have always excelled in the arts. They are today some of our most impressive inventors, physicists, lawyers, media executives, social scientists, and civil servants. And they have been, for decades now, among our most transformative businesspeople—backing and producing technologies that have altered everyday life. Young people today found multibillion-dollar corporations and successful NGOs. As young staffers, researchers, and yes, interns, they do much of the analysis that our lawmakers depend on. Yet we’ve kept in place laws that suggest they lack the intelligence, dedication, and maturity to legislate and govern—at least until they reach a random set of arbitrarily predetermined ages. The fact that these preconceptions have been codified and stubbornly retained says something about how deeply some implicitly fear the idea of young people exercising full political rights. The drafters of these constitutions believed that voters could be trusted to make judgments about foreign policy, taxes, and nearly all of the other qualifications candidates present about themselves. But they could not, evidently, be trusted to assess the competence of young candidates on a case-by-case basis—for that would risk the chance of some ne’er-do-wells actually being elected. Young ones, anyways. The right of ne’er-do-wells older than 35 to run for president is constitutionally protected. In a few places though, very young candidates are allowed to run. And they often win. Vermont is one of a handful of states that allow adults to run for any office they choose. When Kesha Ram was elected to the Vermont legislature in 2009, she became the youngest state representative in the country at the age of 22. She and Hernandez are both members of the Young Elected Officials network, a group that helps young progressive politicians navigate the electoral landscape. Surprisingly she says, she had little trouble winning the support of voters. Like Hernandez and many twentysomethings, Ram’s accomplishments fly in the face of what developmental psychologists might have to say about young people in the aggregate. She was heavily involved in environmental activism as a high school student in her hometown of Los Angeles and debuted a documentary about globalization at the World Social Forum in India. She was awarded the Morris K. Udall Scholarship for her environmental work and was a finalist for the Rhodes Scholarship. As a legislator, she’s sponsored legislation on homelessness, college education, housing regulations, and domestic violence—an issue she took on as the legal director of Chittenden County Vermont’s Women Helping Battered Women, a nonprofit that provides services to victims of domestic abuse. Or consider John Tyler Hammons, who in 2008 was elected mayor of Muskogee, Oklahoma, at the age of 19. Hammons never thought he’d get elected. “I probably didn’t think I was going to win because who’s going to vote for a 19-year-old,” he says. But he did win—twice—and returned to the University of Oklahoma to study law after his second term. During his time in office, he pushed for reforms to the city’s charter, campaign finance regulations, and increases in infrastructure spending. He left office, the Muskogee Phoenix opined, as perhaps the city’s most popular mayor ever. People like Ram and Hammons offer good examples of the kind of public service young people can engage in if they’re allowed to. The idea that either one of them might have been barred from running because of their age should concern us. To be sure, there are broader reasons to back an end to age restrictions. There are legions of youth activists and earnest young people across the nation who will tell you that boosting young adult candidacy would unleash an unprecedented wave of youth activism, make races more competitive, and lead to new action on issues such as student loans and youth unemployment. And they may be right. But such hopes aren’t the central justifications for change. Even if progress on youth issues continues to stall and even if young candidates are beaten out by older and more established politicians—as they certainly will be most of the time—establishing a universal right to stand for public office is worthwhile on its own merits. Whether it yields policy changes and boosts participation or not, a constitutional amendment doing away with age of candidacy restrictions will simply extend rights to a politically underprivileged constituency just as the 15th and 19th Amendments did for women and blacks—a worthy objective in and of itself. After every election cycle we take stock of gains for women, blacks, Latinos, the LGBTQ community, and others in Congress. Over time, we hope, the body will come to look more like the United States and less like a country club—a truly representative body. Lost in these assessments is the fact that it is virtually impossible for young adults to ever achieve a share of Congress proportionate to their share of the population. Only 1 percent of the current Congress is under the age of 35 despite the fact that, again, nearly one-third of adult Americans are. Of course, it isn’t a given that constituencies are necessarily better represented by politicians from their ranks—a white politician can champion policies that help black Americans, a male politician can promote policies that help women. But it should be within voters’ rights to select candidates like them if they believe shared experience really does make a difference. A black voter who thinks a black politician would be better attuned to the issues affecting him can vote for a black politician. A woman can vote for a woman. But a 20-year-old cannot, by law, vote to send another 20-year-old to Congress. Because the 26th Amendment established an implicit separation between the right to cast a ballot and the right to run, he is required to vote for someone at a different station in life than himself. He was right. To cleave apart the right to choose and the right to be chosen is to cleave apart democracy itself. Age of candidacy laws should, intuitively, clash with notions about representation and democratic fairness that we all share. But ours is a society that, for years, sent young people to die abroad without granting them a say in the matter at home. We are all too willing to subvert the rights of youth when we can get away with it. The 26th Amendment was an effort to confront this—a partial assertion that one’s trust or distrust of young adults should be irrelevant to his or her ability to possess the rights of other citizens. An amendment extending the full right of candidacy to all young adults should logically follow. Our democracy will be better for it.